Halloween is nearly here! Still need ideas? Head over to the Halloween Project Archives for a list of our projects over the years. Halloween is one of our favorite holidays, and … we’ve organized dozens of our Halloween projects into categories: costumes, pumpkins, decor and food. This entry was posted in Costumes, Play with your food and tagged Halloween. Bookmark the Permalink. This entry was posted in CNC, Costumes and tagged AxiDraw, Halloween. Bookmark the Permalink. Head over to the Halloween Project Archives for the full list of projects. This entry was posted in Art, Costumes, Play with your food and tagged Halloween. Bookmark the Permalink. I just received your Larson scanner for my Foam Cylon helmet today … I have since this video diffused the light inside the clear conduit pipe the LEDS are held inside of to make the LED effect a bit more smoother. He has been posting updates of the costume on facebook. This entry was posted in Costumes, Electronics, Microcontrollers. Bookmark the Permalink. 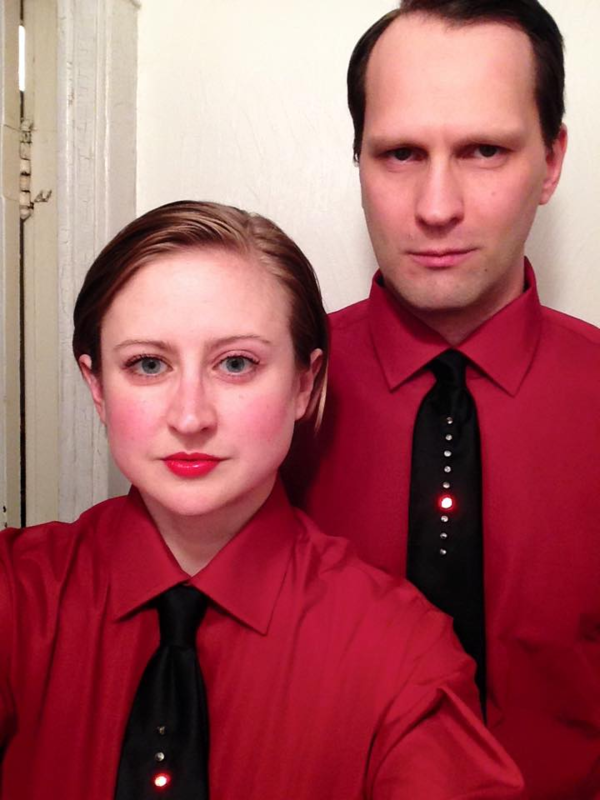 RJS sent in these pictures from Halloween this year after making our Larson Scanner kit in its Kraftwerk Tie incarnation. Thanks for sharing the pictures, you both look awesome! 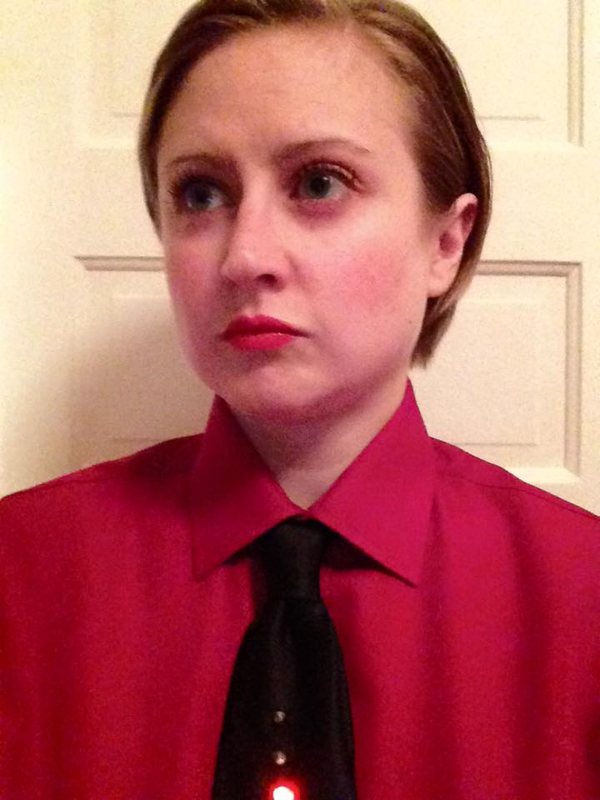 This entry was posted in Costumes, Electronics and tagged Halloween. Bookmark the Permalink. Halloween is one of our favorite holidays, and our collection of Halloween projects continues to grow. Every fall we update it to include our latest projects for the season. In the list … we’ve organized dozens of our Halloween projects into categories: costumes, pumpkins, decor and food. This entry was posted in Art, Costumes, EMSL Projects, Play with your food and tagged Halloween. Bookmark the Permalink. 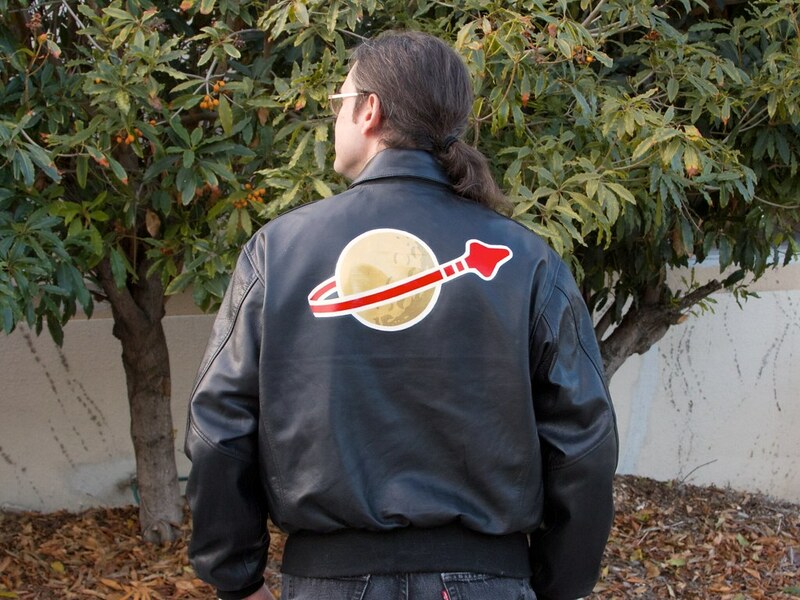 Last January, I wrote about how to make your own traditional painted-leather “bomber” jacket, in a tutorial about how I made my Classic Lego Space Flight Jacket. Since then, several people have asked us for a future update post, to see how well it has aged after a year. And so, here we are. After a year of regular use, how well are those nifty flexible leather paints holding up? This entry was posted in Art, Costumes, EMSL Projects and tagged art, diy, jacket, lego, painting, wearables. Bookmark the Permalink. For Halloween this year, I went as a robot, wearing a silver dress with a slowly pulsing LED heart glowing visibly under the fabric. The LED is a one watt white LED, which we’re running at about 50 mA. It has a wide viewing angle, and the star-shaped mount lies conveniently flat. 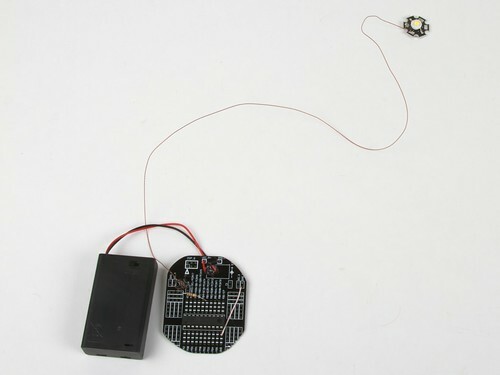 The LED is wired up to the PCB with a pair of twisted magnet wires. 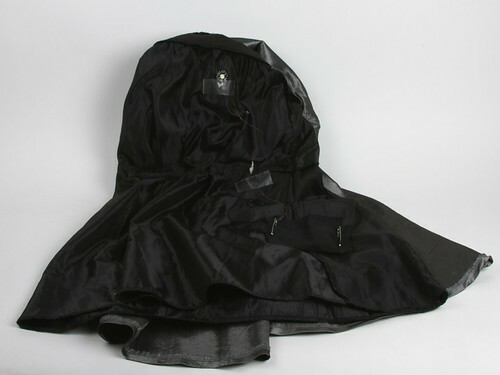 Magnet wire is flexible and thin, which makes it hardly noticeable under clothing. It is controlled by ATtiny2313 (running the code from our Mac sleep light pumpkin project) and powered by three AAA batteries. The PCB corners were rounded off so it wouldn’t be stabby. 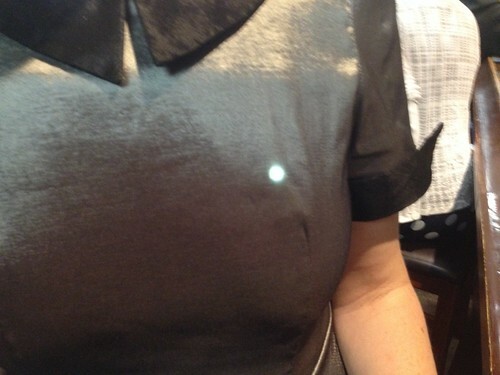 The dress was fully lined, which made it very convenient for mounting electronics. 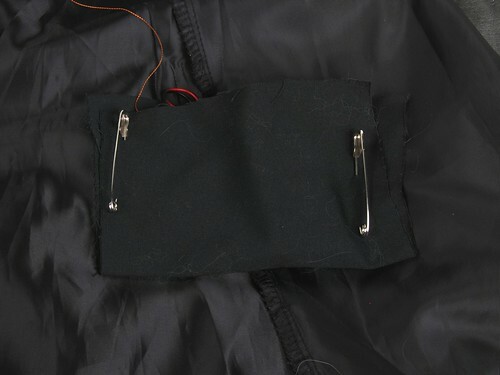 I pinned a makeshift pocket onto the liner, and tucked the battery holder and PCB in the pocket. I could feel the battery holder switch and turn it on and off through the fabric. The LED was taped to the dress liner with medical tape to hold it in place. An extra piece or two of tape held the wires to make sure there was appropriate slack for movement. (A note on tape: use the good stuff. The cheap paper tape in the off-brand first aid kit only stuck to itself and the magnet wire. 3M plastic medical tape worked great and came off easily.) This makes it easy to disassemble after Halloween. 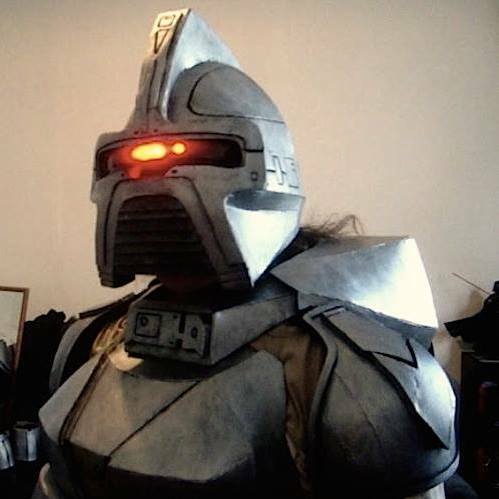 You can find more costume projects in our Halloween Project Archive. 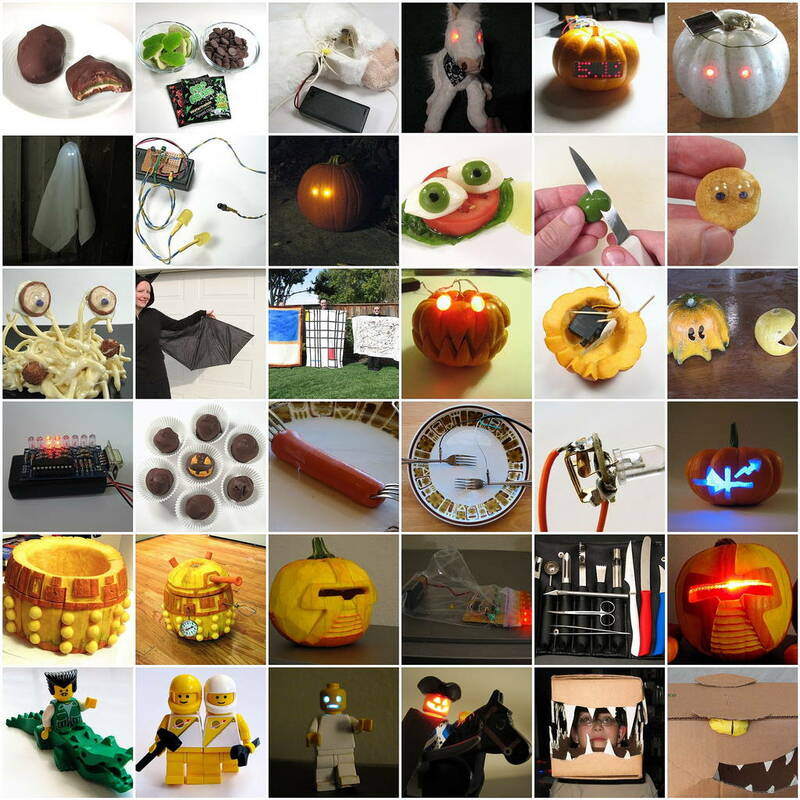 This entry was posted in Costumes, EMSL Projects, Engineering, Microcontrollers and tagged Halloween. Bookmark the Permalink. Umbrella Upcycle is a project site filled with things you can do with cast-off and broken umbrellas, including our Better Bat Costume. The project is aimed at reducing the numbers of umbrellas that end up in landfills, and they link to project tutorials, methods of recycling, and recommend places to donate both umbrellas and finished umbrella projects. This entry was posted in Art, Costumes, EMSL Projects. Bookmark the Permalink. 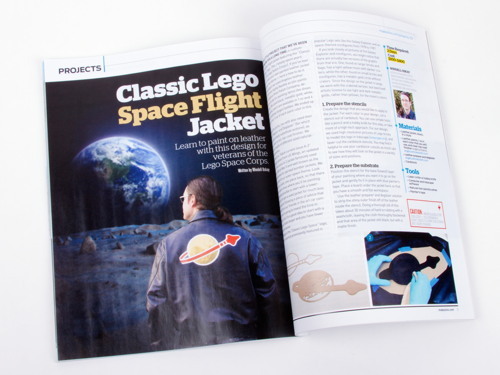 My Classic Lego Space flight jacket project appears starting on page 70 of the current issue of Make: Magazine, Volume 39. You can find the complete instructions on our blog, here. 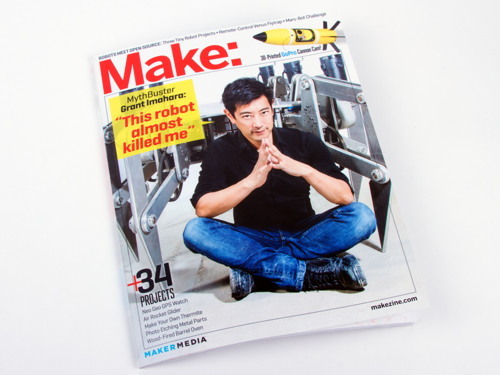 This entry was posted in Art, Costumes, EMSL Projects, General News and tagged lego. Bookmark the Permalink.